With almost 75,000 entries covering all areas of law, plus relevant terms in related spheres of expertise, this new Essential Edition is based on the popular Fourth Edition of the English/Spanish and Spanish/English Legal Dictionary. These are the dictionaries that lawyers, law students, translators, and those working in English and Spanish in law and associated fields have been trusting since the First Edition was published in 1993. 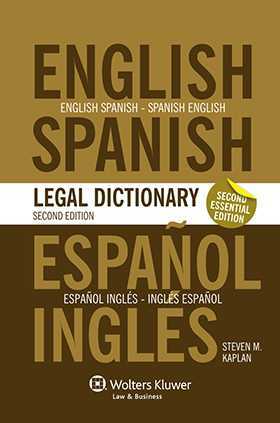 Because of its straightforward and naturally intuitive format, there are no special rules or indications for effective use of the Essential English/Spanish and Spanish/English Legal Dictionary. Users simply look up a word or phrase, get the equivalent, and return to their legal work. The general presentation of the dictionary is easy to read, and facilitates finding the desired terms and equivalents with the least time and effort. The convenient paperback format makes it a must-have for school, home, and the office.